This is going to be a picture light/text heavy post. It can’t be helped. If you have ever played in a Roleplay Game, like Dungeons & Dragons, character death is a very real possibility for every player. And by that I mean, you have created your halfling adventurer, found an adventuring party, entered the Kobold Mine looking for the stuff they stole from the local village, fought your way past an army Kobolds, leveled up (gaining new abilities, a sense of self worth and attachment to your character), and then died in the boss fight. No problem, you can roll another character and continue adventuring in the game, right? Character death happens in roleplay games, and it is a very real mechanic that reminds the players that they are not (necessarily) gods/all powerful. But my feeling is it is often misused. I don’t mean maliciously. I just mean that through ignorance, slavish adherence to systems and dice or whatever, character death happens when it shouldn’t. I have probably created a division among Games Masters and players in every land by making that statement. So, in order to explain my thoughts I ask the question, what is the purpose of your game? I am going to be simplistic and refer to 2 purposes. I suspect there are more, like I say I am being very simplistic here. Purpose 1. A Contest between players. For some, a roleplay game is a player versus player contest. The Games Master concocts a deadly dungeon, crafts a plot to lure the players into it and tries to stop the players achieving their goals. The players roll stats, pick classes and races, equip their starter gear and go adventuring. You can have a very rewarding experience as a player, attempting to outwit your opponent, as Games Master waiting for the players to miss the clue that will trigger your traps…or as players concocting a strategy that will allow you to face wave after wave of monsters. That does sound like a lot of fun. It works remarkably well for Dungeons & Dragons. (There is an assumption here that none of the players are willing to cheat to achieve victory – Players & Games Masters must be able to trust one another and not be willing to shaft the other for the sake of winning. This true in any iteration of the game). And, in a contest between players character death is very possible. And games like Dungeons & Dragons are built to accommodate this. If your character dies, you can simply role a new one. Roll a dice. You have their stats. Roll another one, or several, and you have their entire background. You can die as often as you need to because you can always roll another. Like I said this is fun. Purpose 2. To tell a story. In this version of the Roleplay Game, the players are the main characters in a story that everyone is telling. The Games Master is providing a framework, and the players are creating the story. I discuss the theory behind this in my creative writing blog when talking about the plots of two films, Avengers Assemble and Transformers 3. I recently reblogged the post here, however here is a link to the original POST. You only need the Theory Bit. In essence, the Games Master provides the Narrative, the players provide the Plot (for the most part – the Games Master provides some, but it should be predominantly player driven) and the outcome is the Story. If the players are the protagonists in the narrative it doesn’t make sense to for them to die every other week and be replaced by a random newcomer. Don’t get me wrong, not everyone plays a roleplay game to tell a story. A lot do want the contest, to be the best wizard or warrior. But in this version, that is not the purpose. You want to tell the best story. That doesn’t mean characters are immune to character death. But character death should only happen if it makes a better story. And only if the player agrees. 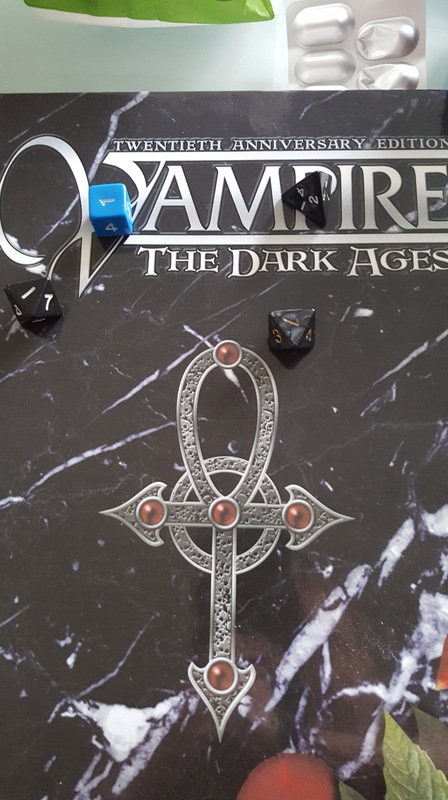 A few years back I was playing a game of Vampire the Masquerade. My character was called Gabriel, he was a master swordsman and a few other things. We were on a mission to punish some evil vampires (ok. Enemy Vampires). I had my best mate with me as back up. Piece of cake. My best mate frenzied. Meaning he gave himself over to the beast. He lost all reason and became a murderous rampaging vampire intent on draining anything in range. And believe me, he was powerful enough to do it. I had several choices. Run and/or Hide. I was fast enough to get away, and my stealth was powerful enough to get away. I could meet him head on with broadsword and fight him to a standstill. I could perform an incredibly risky maneuver whereby I stood my ground, almost defenceless and try to calm him. Option 1 wasn’t an option. We were in an urban area. My character had a strong moral code. He couldn’t abandon the innocents nearby. Option 2 wasn’t an option. I might have to kill my friend. That left Option 3 with a fervent hope that things didn’t go wrong. Of course they did, and I was devoured by my best friend in that game. I had played Gabriel for two years and was deeply disappointed. As would anyone be. I didn’t want to stop playing Gabriel, but this was taken completely out of my hands. That is what a player feels when they have a senseless character death. My only consolation, Gabriel died well and appropriately. It was and it wasn’t a meaningless death. The berserk friend happened randomly, rather than at the instigation of a master villain. So, meaningless. But, Gabriel died protecting the innocent, and since his character was a basically a Grail Knight in the modern day I could reconcile the death. Deaths in games should never ever be meaningless. It should be a big deal. I can feel the angry glares of lots of Games Master staring at this right now. Some might even be tempted to mash a keyboard to write a furious response. A roleplay game is not real life. Protagonists in stories are often larger than life, cheating death by the narrowest margin. And the players are your protagonists. If they have invented a character they love, having them die in a random rockslide just feels rubbish and boring. I will happily admit I have spared character lives when dice dictate death because it didn’t make a good story. In the game I run, I have crafted a plot that doesn’t work if the players weren’t there at the beginning. I want them to help me tell that story. That doesn’t mean it has to be easy. There are plenty of ordeals a character can endure without ever dying. Gaining an enemy, having their loved ones imperiled, the loss of vital stuff. If the purpose of the game is telling a story, then having the character go through ordeals makes for a better story. It is a basic principle of storytelling. Characters go on a journey, go through ordeals, and grow. It makes the character interesting. And if a player comes through the ordeal the other side they will gain a measure of Catharsis. Victory hard fought and achieved by the player is the best feeling for the player in a game. Believe me, I have experience of this. When playing a game of Marvel Heroic as a version of Moon Knight my character started at rockbottom. He had a broken body and low tech Iron Man armour. Through a series of ordeals I gained a power up on the armour and my body healed. Later in the game I gave up my armour, as it was appropriate to do, in favour of a spiritual power set that made Moon Knight into the equivalent of a Dungeons & Dragons Paladin of Khonshu. My journey continued. We continued on the story, and again I hit rockbottom losing all of my powers. I gained a temporary power boost via demonic symbiosis thanks to Dr Strange, which led to the destruction of several souls along the way (challenging this version of the character’s morality and making him feel guilt) until Moon Knight was freed of the Demon and found his god. In the finale, Moon Knight realised his destiny, that he was Khonshu and we succeeded in the Campaign. None of which would have been anywhere near as satisfying if I hadn’t suffered the ordeals along the way. I have three different stances on it, depending on the game. In D&D you have an adventuring party. Should someone die but the rest survive, they can hire someone new (leading to a fun interview panel event). In something like Warhammer Quest (or my one-night-onlys) death is expected and normal. In something like Descent it’s impossible for a character to die, and that actually bothers me a little. To me, in general, characters should never be deliberately killed by a gm, it’s not the objective to kill the players but create a story. But if the rules of the game eliminate the chance of the survival, they should die, no hard feelings, let’s see who comes along next.